A guard company reporting system does not need to be complex in order to deliver everything that your clients demand. The opposite is, in fact, true regarding the operation and use of your mobile reporting software. The GuardMetrics team has held to this basic principle—Keep It Simple Soldier—in the development of all of our products and services. You don’t need to worry about retraining your security officers to be “techies” in order to quickly and efficiently deploy this guard company reporting system app. You will be an expert with only an hour of training, and the user interface for your mobile patrol officers is really as easy as it looks in the pictures of the mobile app example. 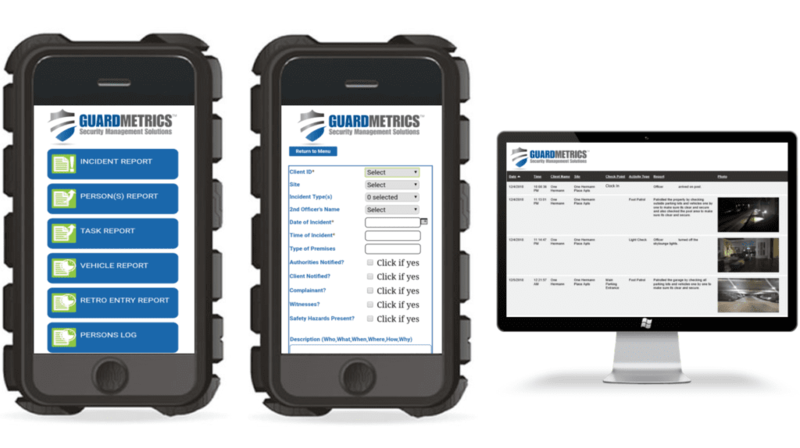 Call a GuardMetrics professional at (800) 825-6858 to quickly deploy an effective guard company reporting system. We have simplified real-time mobile reporting by making the DARs and Incident Reports a combination of about 70% drop-down choices (you define; broken window, suspicious vehicle, fire-extinguisher-check, etc. ), 20% check-boxes, and only about 10% typing or speech-to-text fields. The patrol officer can then easily attach whatever picture or video that may be applicable, then press the large “submit” button at the bottom. If it is an emergency, and the officer should not wait until the supervisor accesses the management portal (from any smart-device), the officer has a drop-down list of personnel–that you have specified–to alert by pushing that report to them immediately. When the officer submits a report it goes into the system in real-time for management to “dot the i’s and cross the t’s” before viewing by the stakeholder. You can then send your client the reports or, your client can view the reports and look at the data any way they wish; stored in their own personal Client Portal—whichever you/they prefer. 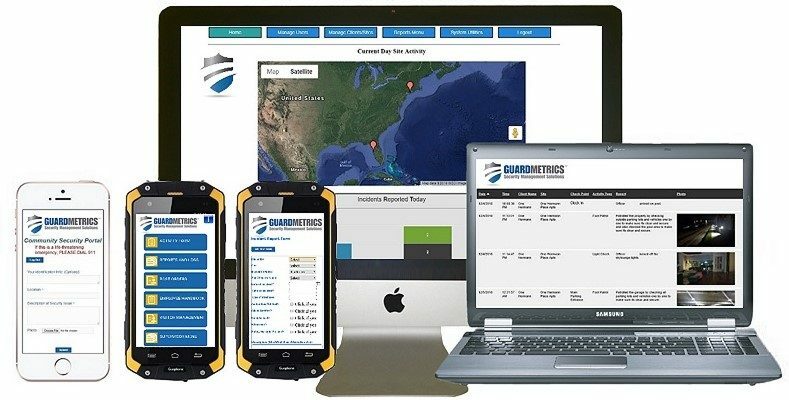 Contact us at (800) 825-6858 for a demo to see how user-friendly a guard company reporting system can be. Every event—whether it be a patrol or tour generated Incident Report, Daily Activity Report, or check-point scan tracking—is time-stamped and geo-tagged. The coordinates, as well as a satellite pic of the location, are attached to the report for both you and your client (option) to see that everything is going as it should. That kind of accountability is exactly what stakeholders seek from their security guard company of choice. The final report that your client receives is branded to you. We replace the GuardMetrics logo with your logo so that your client identifies this technology and the respective capabilities with your security guard business. They are now able to view a professional report, with all the detail they desire, open the attached video and/ or see the attached pics and GPS position: Everything a stakeholder could hope for from a guard company reporting system. Call GuardMetrics now and have your branded security guard company reporting system deployed within days.